Mangaluru, Jan 12: Vrindavan Luxury Apartment Complex, developed by well-known Builders & Developers Nidhi Land Infrastructure Developers India Pvt. Ltd, situated at Gandhinagar, Mannagudda will be inaugurated on 15th January 2017. This complex is situated in Mangalore’s prestigious residential area Gandhinagar in 1.7 acres of land surrounded by verdant greenery. It will be inaugurated by Mr. B. Ramanath Rai, Hon’ble Minister for Forests, Ecology & Environment and District-in-charge, Government of Karnataka, at 6.30 p.m.
Mr. U.T. Khader, Hon’ble Minister for Food and Public Distribution, Government of Karnataka, Mr. Nalin Kumar Kateel, Member of Parliament, Mr. J.R. Lobo, Member of Karnataka Legislative Assembly, Capt. 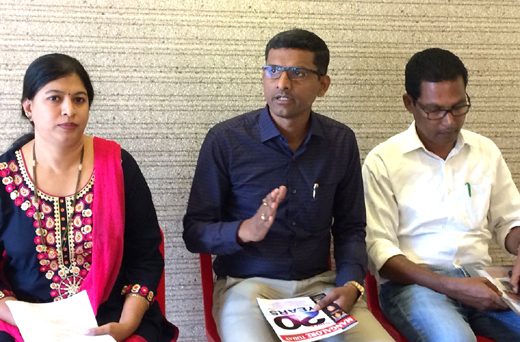 Ganesh Karnik, Member of Karnataka Legislative Council, Mr. Harinath, Mayor, Mangaluru City Corporation, Mr. B. Padmanabha Kotian, Member of Karnataka State Dharmika Parishad, Mrs. Jayanthi Achar, Corporator, Mangaluru City Corporation, Mr. D.B. Mehta, President, CREDAI, Mangalore will be present. B.K. Vishweshwari, In-charge, Brahma Kumaris, Mangaluru Centres, will render the blessings. Vrindavan boasts of high-end amenities and most modern facilities. Four water purification units of 1.5 lakh litres each have been installed. The water supplied by the City Corporation and borewell gets purified by this unit before it is supplied to the residents of the apartment. A most modern garbage disposal system is an additional facility. The latest sewage treatment plant as per mandatory requirements has also been installed. Another speciality is the air-conditioned indoor stadium and gym that has been planned in an innovative manner. The stadium offers facilities such as billiards court and scope for indoor games such as carom, ludo and chess. The piped music lends an air of cheerfulness and the chairs, in the colour of ludo dice, are sure to motivate children. In addition, EPDM flooring ensures that children can play here in all seasons. There is a yoga and meditation room as well. For the benefit of senior citizens the apartment management has provided mini gardens which function as relaxation spots. Another speciality is a mini waterfall which would add to the feeling of peacefulness in the entire complex. You enter the premises of Vrindavan through a Censor-enabled entrance gate. Every apartment owner will be provided a sensor remote which can be operated through a fingerprint scanner. This ensures that no unauthorized person enters the premises. In addition, 77 CC cameras have been installed. The CC camera in the lobby is meant to let the apartment inmates have a look at the visitors before being ushered in. Vrindavan offers 2 and 3 BHK stylish and modern luxury residential apartments in Gandhinagar, Mannagudda, one of the most elite residential localities of Mangalore, which is within a minute’s walk from all civic amenities such as reputed educational institutions, stadiums, centres of entertainment and shopping, parks, libraries and healthcare. The Mangalore International Airport is at the distance of 10 km and the railway station is 3 km away. Nidhi Land residential complex comprises 4 blocks. It has a basement, ground and five floors to accommodate 109 apartments. An entire section of one and half floors has been set aside for the civic amenities of the residents. Security, Club House, Waterfall-facing AC Gym, AC Visitors Lounge, Amphitheatre, Jogging Park, Swimming pool, Children’s Play Park, Glass-enclosed Automatic Elevators, wide passages for the convenience of inmates, Garbage chute, Sewage treatment plant, spacious balcony and many such other facilities ensure the privacy, safety and comfort of the those that choose to live in Vrindavan. Nidhi Land Infrastructure Developers India Pvt. Ltd, managed by the brothers Prashanth Kumar Sanil and Sharaschandra Sanil, has enriched Mangalore with quality construction and development projects. It has gained the trust of clients by ensuring excellence in construction quality and timely delivery of projects. “No compromises have been made in the quality of the materials, planning, infrastructure and finishing. This is a high-end luxury project and satisfying our clients, who have high expectations from us, is our priority” says Prashanth Kumar Sanil. Nidhi Land Infrastructure Developers India Pvt. Ltd, is an ISO 9001:2015 institution. It has experts from Infrastructure Developers India as consultants. For more details, you may contact the firm’s office at Pinto Chambers, Bejai, or log on to www.nidhiland.com.